James was born and raised in Searcy, AR, and is a graduate of Harding University. The great outdoors have been a huge part of his life since day one. He caught his first trout when he was just four years old and has been addicted to the river ever since. 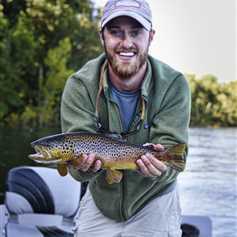 Now, as a trout fishing guide on the Little Red River and owner of Tailwater Fishing Company, James spends hundreds of days each year on the water. He knows the ins and outs of the river area and can help find the right property for you. He is the river property specialist for our office, and he would love to work with you. If you are looking to purchase a weekend getaway, an investment property, or the home of a lifetime, James is ready to help. Or if you want to make sure your river property gets marketed the right way and sells for top dollar, James is here for you. As a guide, he is regularly in contact with potential buyers who would be able to purchase your property.